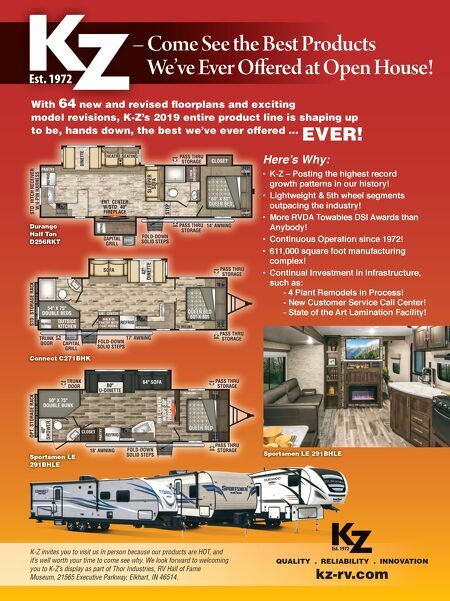 Venture RV offers a complete lightweight lineup for 2019, from the ultra- lightweight Sonic Lite (dry weight 2,480 pounds) to the luxurious SportTrek Touring (all floorplans w/bed slides). Sonic and SportTrek will feature new automo ve exterior designs, as well as several unique, sales- genera ng innova ons! We will also be showcasing 13 new-to-the-industry floorplans!! Be the first in your market to offer these exci ng new Venture products. VENTURE RV Sonic Lite | Sonic | Stratus | SportTrek | SportTrek Touring Venture Truly is your One-Stop Ultralite Shop! 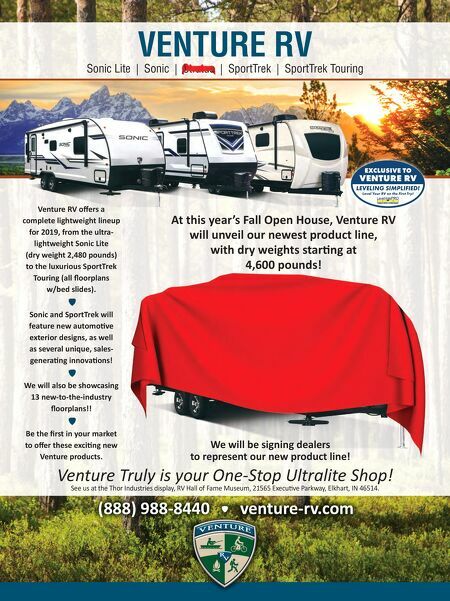 At this year's Fall Open House, Venture RV will unveil our newest product line, with dry weights star ng at 4,600 pounds! We will be signing dealers to represent our new product line! (888) 988-8440 venture-rv.com (888) 988-8440 venture-rv.com (888) 988-8440 venture-rv.com See us at the Thor Industries display, RV Hall of Fame Museum, 21565 Execu ve Parkway, Elkhart, IN 46514.